Sustainable design and reduce energy costs by 50 percent compared to the Minnesota Energy Code model. An extended-size, 53,000 cubic-foot-per-minute (cfm) Vision® air handling system from Daikin. This unique system is designed not only for high air exchange (which contributes to high IAQ), but also for low energy consumption. Already recognized as a leader among baccalaureate colleges for its commitment to science education, St. Olaf College, Northfield, Minnesota, anticipates being one of the few institutions worldwide to receive a LEED® Platinum rating for a science facility. The college’s new Regents Hall for Natural Sciences, a teaching and research center which opened in September 2008, will provide a learning experience for students, faculty, staff and visitors well into the 21st century. The 190,400-square-foot building combines interdisciplinary education with sustainable design and is expected to reduce energy costs by 50 percent compared to the Minnesota Energy Code model, which is now based on ASHRAE 90.1. Science centers are not by design energy-efficient, due mostly to their high air-exchange requirements. One of Regents Hall’s many sustainable features is an HVAC system designed with an innovative extended-size, 53,000 cubic-foot-per-minute (cfm) Vision® air handling system from Daikin. This unique system is designed not only for high air exchange (which contributes to high IAQ), but also for low energy consumption. In fact, it helped the college earn LEED points and meet its budget requirements. The anticipated LEED rating also underscores the college’s commitment. The Platinum rating is the highest of the four-tiered LEED rating system, which awards points based on sustainable site, water efficiency, energy and atmosphere, indoor air quality, and materials and resources. The building was designed to meet LEED NC (new construction) 2.1, which requires that 52 credits be met in order to achieve Platinum certification. St. Olaf anticipates achieving 14 out of 14 possible credits in the Sustainable Sites category; 4 out of 5 for Water Efficiency; 16 out of 17 for Energy and Atmosphere; 9 out of 13 for Material and Resource; 12 out of 15 for Indoor air Quality; and all 5 possible Innovation credits. The $64 million building, designed by the Rochester, Minn. office of the architectural firm Holabird & Root, based in Chicago, not only replaces a 40-year-old science building, it is a model for interdisciplinary science education. While Chemistry 101 is still taught here, lessons include how the green roof impacts a waterfall collection system to reduce the cooling load. Regents Hall is also the first major science facility in the country designed for “green chemistry” which minimizes the hazardous chemical waste from lab experiments. The labs use one half the number of fume hoods compared to the same curriculum with conventional chemistry. In all, the building includes 26 teaching labs, seven tiered classrooms, 11 flat-floored classrooms, eight seminar-style rooms, five dedicated computer rooms, an 8,000-square-foot science library, student-faculty research space, group study spaces and informal gathering spaces. This adds up to an 850-ton cooling load for the entire building. Helping to reduce that load are innovative sustainable systems such as a green roof, abundant day lighting, highly efficient use of ventilation air and a heat recovery system to reclaim exhaust air energy. 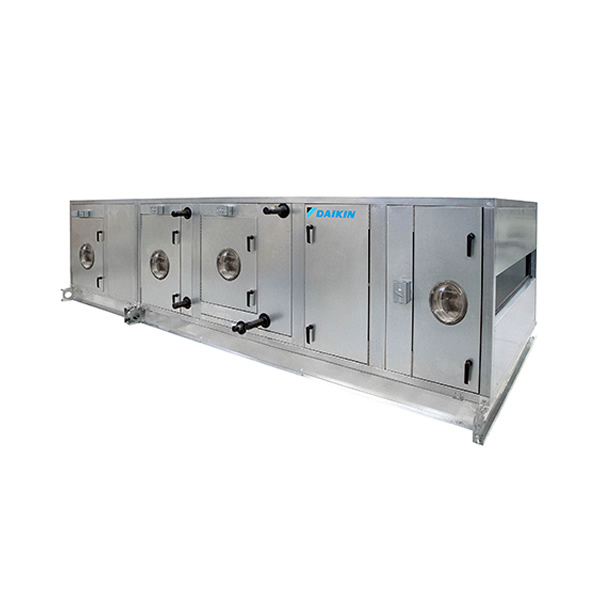 The air distribution system has several energy-saving features: a heat recovery loop, a cascade air system and a low-flow VAV fume hood exhaust system. All depend on the flexibility of the extended-size Vision air handling unit. Facility officials at St. Olaf and the project design team worked closely with Schwab-Vollhaber-Lubratt, Inc., St. Paul, the Daikin rep firm, to design a system that exactly met their requirements. The first of these features is a glycol heat recovery loop that recovers heat from the laboratory fume hood exhaust air stream. A standard water coil is located in the laboratory exhaust manifold upstream of the exhaust fans and a similar coil is strategically located in the air handling unit. Energy is transferred from the warm exhaust air to the glycol loop and transported to the air handling unit coil where it is used to preheat the outside air coming into the unit. Even during very cold outdoor conditions, the need for steam heat is greatly diminished due to the heat provided by the heat recovery coil. If necessary, a reheat coil on the VAV boxes will reheat the air when it reaches the space. Regents Hall is divided into east and west wings joined by an atrium. The extended-size Vision air handling unit serves the entire east wing. Five smaller Vision air handling units serve the west wing and a single, stacked Vision unit serves the Link, which connects Regents Hall to the newly remodeled Old Music Building. Originally, nine air handlers were specified, but the extended-size Vision unit replaced three of them, significantly reducing installed and operating costs. The extended-size Vision unit, with a coil face area of 142.5 square feet, is built on a custom-modular platform. Compared to custom units, the Daikin single unit reduces cost in part by eliminating a common wall and minimizing space requirements. The Daikin Variable Dimensioning® feature lets engineers specify cabinet sizes in increments of two inches high and four inches wide, making it easier to configure a short-and-wide unit for Regents Hall’s high-air-volume requirement. Dual plenum fans in the unit also help reduce energy consumption as well as ensure quiet operation. The modular construction simplified installation, according to Pumper. Vision units are assembled at the factory and shipped in sections. The units are built with a patented splice collar to simplify section-to-section fit and seal without additional nuts, bolts, screws, gasketing or caulking. “Our foreman said that the units were well built and easy to put together compared to some others he’s done,” said Pumper. With so much attention to energy savings, Sandberg knew the operating data would be positive, but even he is surprised. “We’re operating at one-third of the predicted costs,” he said.